PS: We’ll stop nagging you now! Together with other websites and a network of fans around the world, this community has fought long and hard for the full revival of the Shenmue series. This announcement follows a prolonged campaign to #SaveShenmueHD, just as Shenmue 3’s announcement in 2015 was the offical climax to the #SaveShenmue campaign. 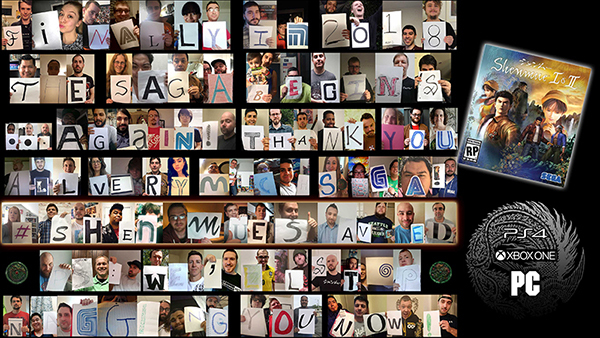 To celebrate the achievement of these goals, the new collage was finalized in time for the 75th Shenmue Tweetathon, which on May 3rd used Sega’s choice of promotional hashtag, #ShenmueSaved. From June 3rd onward, the monthly Tweetathon will become an opportunity to simply spread the love for #Shenmue, as we await the release of Sega’s enhanced versions of Shenmue 1 & 2 as well as the sequel in development by Ys Net. Fans can customize a tweet for automated posting every 3rd on the Team Yu website. Previous collages created by the group can be seen here and here.